The the planned June 12 showdown between WBA super welterweight champion Yuri Foreman and former welterweight and junior welter champion Miguel Cotto could be moved to the new Yankee Stadium in the Bronx. Cotto traditionally fights in New York City’s Madison Square Garden on the day before the Puerto Rican Day Parade, but Top Rank is looking at a bigger venue to accommodate 30,000+ fight fans. 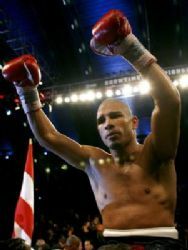 Cotto would join many great fighters who have fought at the old Yankee Stadium including Joe Louis, Muhammad Ali, Sugar Ray Robinson, Rocky Marciano and Jack Dempsey. The last fight there was Ali-Norton III on September 28, 1976, also promoted by Top Rank.